Peppers are so versatile. You can stuff 'em, bake 'em, stick 'em in salads, ratatouille and curries... So growing organic peppers is a wonderful way to add interest to your kitchen. In the shops, you won't find anywhere near the variety you can grow yourself, thin and thick-walled, hot, sweet or hot and sweet, round, square, or long and thin. And the colours! Did you know that you can grow peppers that are purple, white and chocolate-coloured as well as plain old green, yellow and red? Shape is not a good indicator of flavour, even though supermarket peppers are usually sweet bell types or long hot types. Of the bell peppers, the thin walled types mature earlier than the thick walled ones, and are therefore more suitable for Northern areas. Capsicum plants average 50cm (18") tall by 40cm (15") spread, although dwarf cultivars are available, especially for growing in pots. 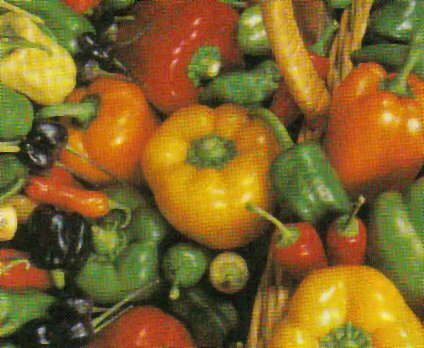 Peppers have high light requirements and need warm conditions, greater warmth than required by tomatoes, but less than for aubergines. They grow best under glass, in polytunnels, or under cloches. They should be given a warm, sheltered position when grown outdoors. Ideal pH is 6-6.5. Soil should have a high humus content and good water retention. Avoid freshly manured sites, or leafy growth will be increased at the expense of fruit. Apply a base dressing of fish, blood and bone (wear gloves) at 60gm/sq metre (2oz/square yard) 2 weeks before planting. Sow indoors in mid March (for indoor crops) or early April (for outdoor crops) at 70ªF (21ªC), about ¼" deep. Prick out into pots or modules at the 3-leaf stage. Reduce temperature gradually until planting time. Transplant when first flowers show, at 10-12cm (4-5") high, indoor crops early-late May, according to region, outdoor crops early-late June. Harden off carefully before transplanting into warm soil. Space plants 40-50cm (15-18") each way, dwarf cultivars 30cm (12"). Plants normally grow first on a single stem, which then branches naturally when about 12cm (5") high into two, producing a crown or fruit bud at this point. If the plant is growing vigorously this can be left to develop into a fruit, which will help to balance excessive vegetative growth. If the plant is growing slowly, remove the crown to encourage the development of more sideshoots and make a sturdy plant. The aim is to develop strong plants which can sustain the weight and development of the fruits. If plants seem very weak and spindly, pinch out the growing points of the main shoot or shoots when the plants reach about 30-40cm (12-15"). Peppers do not normally need staking, but if it seems necessary, they can be tied to canes. Do not allow plants to dry out or become waterlogged, but water little and often, and mulch. Once fruits start to swell, give a liquid feed of half-strength tomato fertiliser or comfrey liquid every two weeks, or use seaweed feed. Fruits are ready for picking when smooth and glossy, from about July indoors or August outside. Start picking when sweet peppers are tennis-ball sized to encourage the development of more fruits. When frost seems imminent, you can pull plants up by their roots and hang them in a sunny porch or a frost-free shed. Chillies treated in this way will eventually shrivel and dry on the plant, and can then be picked off and stored in jars. Alternatively, if container-grown, move the pots into the house at the end of the season. Peppers are a perennial plant, so they will continue to grow if placed in a bright position. Aphids, whitefly and red spider mite can cause problems on greenhouse crops. Treat aphids and whitefly with derris or fatty acid sprays. You can also plant deterrent plants, like French marigolds, nearby. Spider mite is usually found in very hot dry conditions, so keeping the greenhouse relatively humid will prevent them. Alternatively, if grown in containers, you can move them outdoors while the hot weather lasts, or you can use the predator, Phytoseiulus persimilis. If you decide to use predators, you neeed to introduce them to an enclosed area (close off all exits with fine net, such as net curtain) to prevent escape, and to bring them into the greenhouse after the pest has invaded, but before the infestation becomes too severe. Outdoor crops are relatively trouble free.